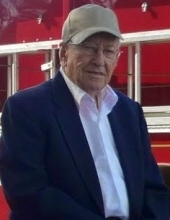 Gail Burdette Bailey 95, son of Harold and Florence (Sheeder) Bailey was called to be with his Heavenly Maker on April 8th, 2019 at The New Homestead in Guthrie Center, Iowa. Burdette was born April 14, 1923, at the family homestead farm southwest of Guthrie. He walked or rode his horse to country school at Linn Grove #7 and on one occasion had a memorable encounter with a skunk that didn’t want to share the road. He attended Guthrie Center High School where a romance blossomed... On October 6, 1938, he married his true love, Norma Branson in Maryville. Mo. They led a full life that was reflected thru their family of 6 children: Barbara Kopaska (Gary), Linda Kopaska (Elmer Jr.), Jacque Hoover (Dennis), Sherrie Winn (Mick), Debbie Moylan (Patrick), and Rick Bailey (Lorna). In 1944 Burdette bought the Franklin farm just down the road from his birthplace where he lived until moving to The New Homestead 2 years ago. The couple worked the farm diligently and as a crowning achievement, paid off the farm in two years when he was told it would never work. He spent his entire life working his land and doing the thing he loved most, farming. One of his biggest treasures was his Charolais cow herd. Never was there a truer friend in every sense of the word. He enjoyed many a ballgame playing with the Bear Creek team and loved to tell the story of beating the Guthrie town team for the season championship. He was a director of The New Homestead. He performed in a group called the Top Hats taking the act to area parade and events. He enjoyed his fishing trips up north and loved hunting deer, pheasant, and turkey all his life and telling the hunting stories that got better every time you heard them. Burdette’s family was his pride and joy. He loved the family gatherings we continued to have at the farm even after he had entered The Homestead. His eyes would light up when he talked about any of them. He liked to boast of his 6 kids, 19 grandkids, 44 great grandkids, and 10 great-great grandkids. With spouses included his immediate family comes to 103. It gave him great joy to tell stories of their lives and successes to all that would listen. He wept for those who left us before him, Norma of 62 years, parents, brother Junior Bailey, sister Juanita Mansell, three brothers-in-law, Bob Branson, George Delaney, and Gene Mansell, sister-in-law Eva Delaney, granddaughter-in-law Kris Kopaska, great-grandson Dane Andersen, and great-great-grandson Loyd Hise. He leaves to mourn his passing his children, grandchildren, great grandchildren, great great grandchildren, a sister-in-law Mary Branson, and a host of other family, friends, and neighbors to celebrate his life. He will truly be missed by all that knew him for his kind easy manner and quick wit. He left us 6 days before his 96th birthday to dance with his bride. He did not pass away, he will walk beside us every day. To send flowers or a remembrance gift to the family of Burdette Bailey, please visit our Tribute Store. "Email Address" would like to share the life celebration of Burdette Bailey. Click on the "link" to go to share a favorite memory or leave a condolence message for the family.